Last Thursday I had the opportunity to sit down for an interview with Denise Dador from ABC 7 Los Angeles right before the kickoff to BlogHer Health 2019. 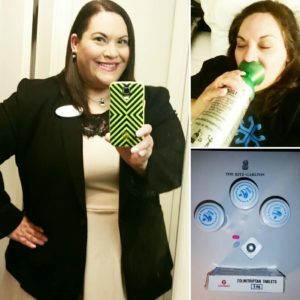 I shared how chronic migraine had impacted my life and why I’m more than happy that Aimovig arrived when it did. 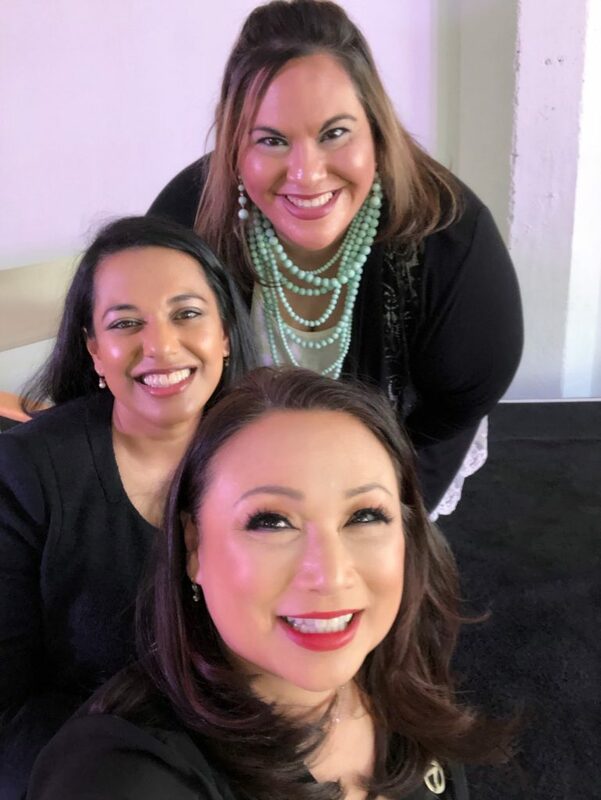 Dr. Amaal Starling and I join ABC 7 Los Angeles’ Denise Dador for a selfie before our #moveovermigraine panel discussion during Thursday’s BlogHer Health. To watch my interview, just click on the link that I’ve provided below. Day 1- I woke up at 3 A.M. to a migraine attack that had me immediately reaching for my Zomig, Benadryl, and Zofran. Knowing my Aimovig shipment was set to arrive by noon, I wanted to make sure I received my first dose that day. I decided to wait until the afternoon to administer the first injection. I wasn’t worried about giving myself the shot, I was just a little concerned I wouldn’t do it right. I looked over the instructions a million times, okay I really didn’t, but it was at least 20 times. By the way, I absolutely hate needles! I do have prior experience with giving myself injections. I once carried Imitrex injections with me at all times from the time I was 16 until my mid-twenties. 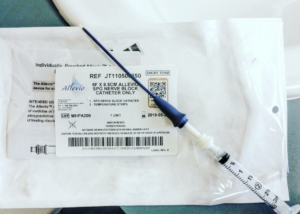 As much as I dreaded having to inject myself during the onset of a migraine attack, I knew that I would feel better within minutes of the medication going through my system. I currently do weekly injections to manage my rheumatoid arthritis and fibromyalgia. The medication is in a vial and is not premeasured which means I have to measure each dosage. Lucky for me, Aimovig comes prefilled and is in an autoinjector. I’ll be honest, I thought I screwed up and didn’t do the injection right. I clicked the button on top, but the yellow line didn’t move. I attempted it again until I finally saw the yellow line of the side of the injector pin slowly drop. I waited 30 seconds before removing the injection and noticed quite a bit of blood. More than I had anticipated. I bled for a good 15 minutes. It wasn’t bad, it just took much longer to stop than any other injection I’ve received in the past. The only issue I had was experiencing soreness in my left thigh for 2 hours post-injection. It basically felt like someone punched me in my leg. Day 2- I woke up feeling great, but that afternoon my head started to give me grief. Around 5 P.M a cluster of dark clouds moved through and shortly after the rain began. The massive left-sided throbbing and pressure spanning across my entire forehead caused me to sit in the darkest room in the house for the rest of the night. My pain level was between a 5-6. My whole face was numb and my stomach was upset. I used my Cryohelmet, Boost Oxygen, Benadryl, Naproxen and an energy drink to ease the pain to a bearable 2-3. This migraine attack stuck around for 6 hours. Day 3- I was not expecting to wake up with some female issues that landed me in the ER. With everything going on with my body, there were no unexpected migraine attacks that day. I was not at all concerned that the Aimovig injection played any role in what happened to me that day. The on-call doctor and nurse also agreed with me. Day 4- After all the excitement from Saturday was behind me, I had a rather relaxing Sunday. I did take things easy as requested by the ER doctor. I’m happy to report no migraine-related issues on this day. Day 5- The morning started out fine. I got a lot accomplished until the humidity spiked and was at 90%. My head made it known it was not happy which caused me to take a variety of over-the-counter medications to get comfortable enough to finish my daily activities. This particular migraine attack lingered around for almost 8 hours. Day 6- I had a fairly decent day. No migraine-related issues, but I did have a sensitivity to light all day. I sported my sunglasses most of the day which is nothing new for me. I’m certain it was due to my fibromyalgia acting up and not at all migraine related. Day 7- My head hated me today. I woke up to excruciating throbbing all over the top of my scalp that only got worse as the minutes passed. I sipped fluids through a straw all day to keep hydrated and wore my Cryohelmet for 6 hours straight. I knew my stomach would only tolerate benadryl and naproxen which I took as directed by my neurologist several times a day. I spent all afternoon stuck in my bed. I was in too much pain to move around. The humidity was 100% which explains why my migraine attack lingered for so long. This migraine attack lasted around 14 hours. What are my thoughts on Aimovig during week 1? It’s too early for me to tell. Weather is ALWAYS a factor when it comes to having migraine attacks. No matter what I tried in the past for treatments, my head does it own thing PERIOD! Now I will say this, since starting SPG Blocks in March of 2017 my migraine attacks are not as severe. I only had one ER visit during that time frame for a migraine attack that was a 10+ and caused me to be severely dehydrated. Considering I was making so many frequent ER visits that the staff knew immediately why I was there before I even mentioned what was wrong with me; that’s one hell of an improvement. 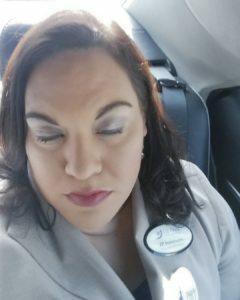 My hope is Aimovig will work in accordance with my SPG Blocks to help me to where I am able to have less migraine days and live a better quality of life. 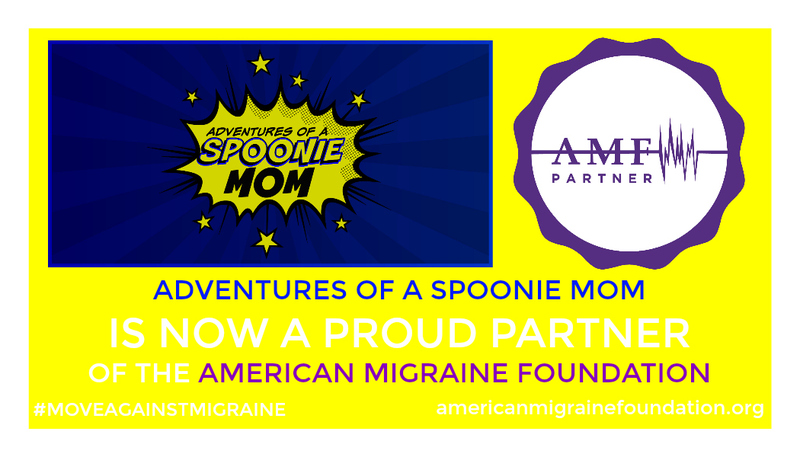 Adventures of a Spoonie Mom is Now a Proud Partner of the American Migraine Foundation! As part of our ongoing commitment to providing meaningful information, resources and support for those living with migraine, Adventures of a Spoonie Mom is thrilled to announce our new partnership with the American Migraine Foundation. The American Migraine Foundation is the official resource for millions of Americans living with migraine seeking reliable information about diagnosis, treatment and advancements in research. 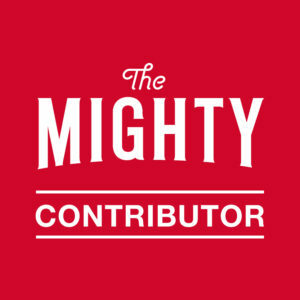 Launched in 2010 as a patient support and advocacy effort of the American Headache Society, AMF’s mission is to mobilize a community for people living with migraine and their support networks, and to drive impactful research into the third most common and sixth most disabling disease around the globe. Like Adventures of a Spoonie Mom, the American Migraine Foundation is dedicated to helping people with migraine live meaningful and pain-free lives. 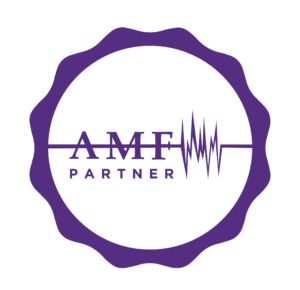 We’re so excited to join forces with AMF to provide support, advocacy and treatment innovations to people living with this disabling disease. The American Migraine Foundation supports people living with migraine by providing free, comprehensive information sourced directly from headache specialists, by maintaining a searchable database and map to improve access to headache specialists, by investing in research efforts towards new, innovative treatments, and by creating support networks and communities where people with migraine can support and learn from each other. We couldn’t be more excited about this collaboration. Be on the lookout for additional resources and enhanced communication from our team in the very near future. 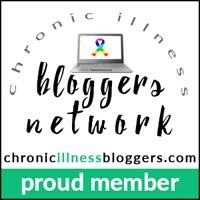 Author AdventuresOfASpooniemomPosted on April 25, 2018 Categories Advocacy, Migraine, Migraine AwarenessTags American Migraine Foundation, chronic migraine, Invisible illness, Migraine, Migraine Awareness, patient advocateLeave a comment on Adventures of a Spoonie Mom is Now a Proud Partner of the American Migraine Foundation! 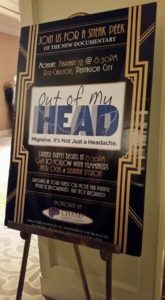 I had the privilege to attend my 3rd Headache on the Hill this year. My son, Colton, was able to join me as well. This was his 2nd time to lobby on Capitol Hill. 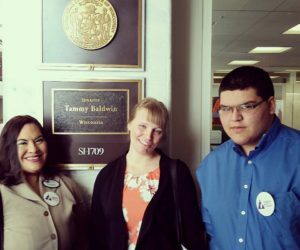 We both have a history of living with the migraine disease and were more than willing to share our own experiences with our state’s congressional members. What is Headache on the Hill? This is an annual lobbying event in Washington DC, organized by the Alliance for Headache Disorders Advocacy (AHDA). The AHDA brings health professionals, migraine & cluster headache advocates and patients themselves to unite on our requests or “asks” of Congress. These asks are typically focused around improving awareness about the impact of Headache Disorders and in turn impacting the available research funding. 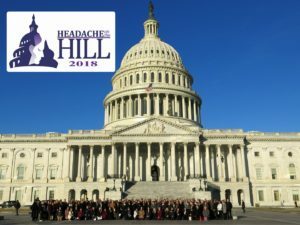 Headache on the Hill (HOH) is a two-day event each year; The first day includes an issues briefing and advocacy training session. The second day is for HOH participants to visit the offices of their respective congressional delegation on Capitol Hill. The AHDA will pre-arrange appointments with the offices of at least one congressman and two senators for each HOH participant. Colton and I traveled out of Green Bay at 7 A.M. which wasn’t too bad except for when we arrived in Chicago with only 30 minutes to catch our flight, and I was hit with a migraine attack while running to our departure gate. The smell of something burning immediately triggered an attack. 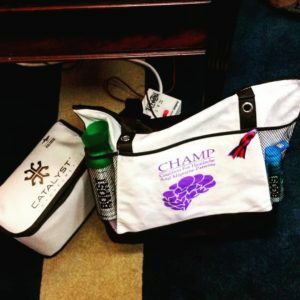 I always carry my migraine emergency kit with me at all times which made it easy for me to down my abortive as I tried to dash through the crowds of people. Unfortunately, I wasn’t able to successfully able to rid myself of this level 5-6 migraine and had to fly with dizziness, nausea, and sensitivity to light. Upon landing at Ronald Reagan International, Colton had the misfortune of getting hit with a migraine attack. His symptoms weren’t as debilitating as mine were on the plane, but he still needed to let his nausea subside long enough so that we could get a taxi to the hotel. 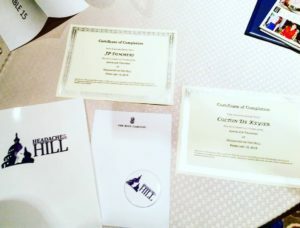 Once we made it to the Ritz Carlton in Pentagon City, I checked into our room and planned on meeting up with the other attendees before our training session, but my head had other plans. I was now experiencing a second migraine attack of the day. This time my vertigo became so overwhelming that I had to lie down for an hour to avoid falling while I walked. When the symptoms finally subsided, Colton and I made our way down to the conference room where the training was already in progress. The room was filled with so many new faces. Most of those people where ones I’ve only met online through various headache disorder support groups. The focus during this meeting was to discuss our “Ask”. 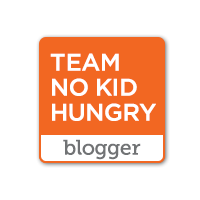 An “ask,” is the actionable request we were making to our Congressmen and Senators. We needed a clear understanding of bill HR4733, aka “Opioids and STOP Pain Initiative Act of 2017” and ask our representatives to co-sign this bill. According to the AHDA, the chronic pain and opioids crisis is the most costly healthcare problem ever. This crisis costs over $1.1 trillion per year, making it the most costly health care problem in our nation’s history. Pain costs $560 to $635 billion (4), and opioid addiction costs $504 billion. The AHDA states that this is equal to the combined revenues of 4 of the largest U.S. companies or 5.6% of the U.S. government’s revenue. As we took a short break, I had a chance to meet the other advocate from Madison, Wisconsin. She was excited about attending her first Headache on the Hill, and I was elated to have another person from my state to spend the day lobbying with on Tuesday. The second part of our training continued for another hour and a half. Unfortunately, Colton was slammed with his 2nd migraine attack in the middle of that session. I helped him up to our room to rest while I returned to pick up great pointers from a respectable neurologist on how we could efficiently approach our congressional members on Super Tuesday. When our training wrapped for the afternoon, I opted out of meeting the new attendees to go check up on my teen. Usually, he needs to sleep with his medications to feel better. In this case, Colton required 8 hours of sleep and additional meds to lessen his debilitating symptoms. I kept my cell on ring incase Colton needed help with something and returned downstairs for the sponsored Dinner by CHAMP (Coalition for Headache And Migraine Patients.) After the meal, the attendees were treated to a sneak peek of the new documentary Out of My Head, with a Q&A to follow with the filmmakers. With a busy Tuesday ahead of me, I retired to my room for the night hoping my health wouldn’t be an issue like it had most of that day. Unfortunately for me, my body rebelled and in a huge way. I woke up with severe vertigo and nausea that none of my natural treatments and prescription abortives, could lessen. Getting dressed then making it to the charter buses on time was a considerable challenge. Thankfully, Colton and Mia, our other advocate from Wisconsin, was there to help me navigate from one side of the congressional offices to the other. A sponsored lunch was provided by The Headache & Migraine Policy Forum. It gave the advocates a chance to rest, grab a bite to eat and listen to a panel discuss the issues that our active duty and veteran military members with neurological disorders face when seeking medical care. I walked away, completely baffled by the fact the VA hospitals are not equipped to handle the volume of military patients looking for relief from their debilitating symptoms. These men and women served are serving our country deserve better options. Hopefully, with more advocates fighting on their behalf, that will soon be a possibility. With so much going on earlier that morning with my health, I wanted to continue to the last two meetings with my state’s congressional members. That just wasn’t going to happen. Once again, my vertigo reared its ugly head making me come to the upsetting decision to go back to the hotel to sleep. Colton knew I was in pretty rough shape is that I could barely walk without assistance. He joined me in the taxi and made sure I got safely back to our room. Mia continued to the last two meetings for Wisconsin. I am so ever grateful to have her on Team Wisconsin! 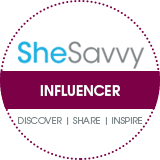 She is an amazing and strong-willed woman that has become one of my good friends in the migraine community. Back in my hotel room, I did everything possible to abort my migraine attack. I hated the fact that after attending my 3rd Headache on the Hill, I had no choice but to sit out because of my neurological disease. The main reason why I came to Washington D.C. in the first place was to share how migraine has affected my life. Now all I could do was lie in bed feeling the worst pang of guilt for not fulfilling my obligation as a patient advocate. It took a good 5 hours before I could safely get out of bed without falling over my own two feet. What most people don’t seem to understand is that having vestibular migraine is often so debilitating that the simple task of walking is almost impossible. How can you function if the world around you won’t stop spinning and your head feels like an anchor, trying to pull your whole body to one side or the other? I lost a job over my neurological disease from not being able to drive for 18 months. When a person tells me to throw sunglasses on, pop some over-the-counter meds and get on with my day, I take big offense to that. I wish it were that simple! I’d love nothing more than to “pretend” my health isn’t an issue, but my body likes to remind me that it is. These past two days in Washington D.C had taken a significant toll on both Colton and I. We fought numerous migraine attacks with very little success. The weather had a big hand in how poorly our heads behaved while we traveled. Of course, that was a factor for so many other advocates besides us. They do say misery loves company and there was an overabundance of it on Monday and Tuesday. At least my evening improved. I was able to attend the dinner hosted by the U.S. 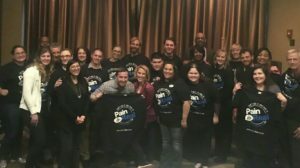 Pain Foundation for their ambassadors and other participants that are involved with them. Colton and I had the honor of sitting at the table with 3 of the people from the Out of My Head Documentary. We had a great time learning more about this family, and I can, in all honesty, say they were the perfect fit for that film. The two days in Washington D.C seemed to fly by as it usually does when I’m in town for Headache on the Hill. It filled my heart to see the 150 advocates representing 40 states. The biggest group of people to date! What this translates to is that more people are becoming aware that the only way we can make a difference is by sharing our stories with individuals that have the power to change things for us. Having a voice is vital for any type medical condition. Migraine may have taken away some of the most parts of my life away from me, but I feel a sense of vindication each, and every time I overcome an obstacle, my neurological disease puts in my way. 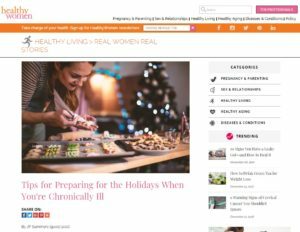 HealthyWomen.org gave me the opportunity to share how I prepare for the Holidays while managing my chronic illnesses: rheumatoid arthritis, fibromyalgia, and chronic migraine. To read my latest article, click on the link provided below. I was given the opportunity to write an article for Healthline.com about my family’s journey with an uncommon type of migraine. Each person living with migraine experiences different outcomes when it comes to pharmaceutical and non-pharmaceutical treatments. In this article for Longevity, I share how a procedure called a SPG Block, helps with both my vestibular migraine and cluster headaches. Last weekend I had the opportunity to do media coverage at my 1st NerdinOut Con in Rochester, MN. Ming Chen, from the hit AMC TV show Comic Book Men, greeted me with a huge hug and took time from his hectic schedule to discuss Funko Pops.